It has been said that the pen is mightier than the sword. But, as a sword must be kept sharp and bright to be effective, so language must be precise and correct if your message is to accomplish your goal. We can create translations from Japanese or Spanish to English (and vice-versa) that will make your documents--be they brochures, websites, books or business correspondence--completely professional looking and perfectly understandable to native speakers. In addition, we are happy to receive your requests for translations that include languages we do not specialize in personally as we are part of a wider cooperative of competent and experienced translators and writers. Naoko Yamamoto is a native of Kyoto, Japan, and graduated from Kochi Medical School before emigrating to Canada. She has studied Genetics and Medical Anthopology at the University of Victoria and has also been trained in the translation of medical texts. Dan Pedrick (B.A., M.A.) 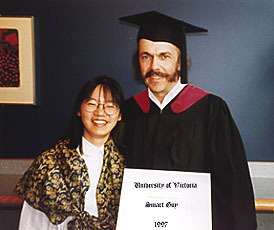 is a graduate of the University of Victoria where he majored in Writing and Hispanic Studies. Dan's articles and columns have appeared in newspapers and magazines in Canada, the U.S., and Mexico. Dan and Naoko work together as a team combining their linguistic, cultural, and academic experience to make your documents clear, concise, and appropriate in tone--and therefore effective. We've seen it all, and for us no job is too big or too small. And our rates are surprisingly reasonable. We look forward to discussing your writing, translation, or editing project soon!